Susan Hill and I went biking today, in 35 degree weather. Either we are foolish, able to deal with harsh temperatures (I am my feet are not), or just hardy/hearty. We met up this morning at around 11:15 am, after her yoga class. I thought it would be warm enough by then to get in a good loop around the river, and while we did get to ride once 'round the Art Museum trails, it was entirely too cold to be out for more than an hour. My toes were in severe pain for about an hour until they thawed out enough for me to regain normal sensation. If I continue to ride this winter, I now realize I must get those stupid looking shoe covers that winter cyclists wear. Ah! more money to spend on biking gear. It never ends! After our biking we headed into Trader Joe's for a quick stop so I could pick up nuts and dried fruit. While we were there, we saw one of the preschool parents from the 'gog. She seemed amazed that we would be out biking in the elements. She called us hardy - and I remarked, we are the Hearty Girls! Catchy, makes me want to add this Nome de plume to my blog. It seems to fit and sounds better than Sturdy Girls, which is the name of a cycling club. We headed back to Susan's house and had lunch - my peanut butter and peach apricot jam on light whole wheat; brown rice sushi from Trader Mings (aka Trader Joe's); and a quick and economical chicken and vegetable soup. I warmed up, my toes returned to feeling like metatarsals again and not digits encased in dry ice. And I was inspired to come home to cook several meals for the coming week. Hooray! You know what this means? The Bicycle Chef is living up to her blog! Biking + Cooking = More Blogs for you to read! I cooked so many things this Sunday and over the past weekend giving me oodles of recipes and photos about which I will write for the next two weeks. Here's the first of several new recipes, all healthy and Weight Watcher friendly and oh so hearty! For lunch this week, I'll be bringing several vegetarian or meat free lunches, owing to my working at a conservative and kosher synagogue. On Monday, I'll have Tuna with Hummus and Shredded Carrots, as well as Curried Tofu "Chicken" Salad. Since I started Weight Watchers, I've completely given up eating mayonnaise. It's not hard to live without the Hellman's, but it is an ordeal to find ways to eat tuna salad on the WW plan that are quick, easy and tasty. I've had to say goodbye to quick trips to Wawa for a tuna shortie hoagie or making a daily run to the deli counter for a scoop of unctuous tuna salad oozing with mayonnaise. Luckily I remembered a tuna fish recipe from my Vorspeise days and have modified it for my core meals. As for the curried Tofu "Chicken" Salad, it's another variation of recipe ideas from Whole Foods and some careful reading of tofu salad containers. I hate spending close to $4 bucks for a 1 cup container of tofu and veggies when I know I can make it better, cheaper and healthier. The tuna with hummus is quick - and you can use any kind of hummus. I like Tribe brand, roasted red pepper. It's low fat and is not high in sodium. Sabra is another great brand, but definitely higher in fat. Yes, home-made hummus is easy to make, but honestly, there are some great brands out there and it's my compromise on finding a mayonnaise alternative. The tofu salad recipe has more steps and prep work, but if you are looking for ways to incorporate tofu into your mostly vegetarian/vegan diet, then this recipe is worth trying. Thoroughly drain the tuna fish. Put into a medium mixing bowl. 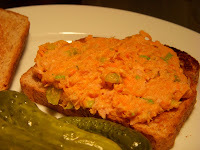 Peel, rinse and shred the carrot using the small/medium holes on a box grater; add the shredded carrot to the tuna fish. Stir in the hummus and celery seed. Mix well to incorporate all the ingredients. Taste and season with salt and freshly ground pepper, adjusting to taste. If the tuna is too dry, add more hummus. Makes 4 sandwiches. I made the Curried Tofu Chicken Salad today and tossed in some golden raisins too. It was delicious. Thanks for the recipe! 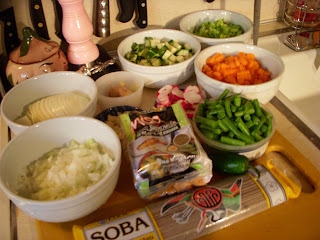 I changed this post on March 29, 2011 - and moved the curried tofu recipe to it's own page. I felt it was lost in the blog and deserved to be written as a single recipe. Many thanks to all who have read this post. If you have questions or comments, feel free to post them here! I will definitely try that! Thanks Barbara - I used to make something similar to this when I worked at a restaurant. Another version I do is with white bean puree/spread. Simple as mashing or pureing some cooked white beans with garlic, lemon juice, a bit of olive oil, salt, pepper and some water to get it all going. Mix into tuna. Top with roasted peppers - very Italian and delicous!